Berlin, Oct 30 (IANS) Bayern Munich has admitted to having a serious striker problem. The 2017 German Champion may sign a new forward shortly. “We will look for a solution as soon as possible,” Hasan Salihamidzic, Bayern’s sports director, said in advance of the club’s Champions League group game against Celtic Glasgow on Tuesday evening. 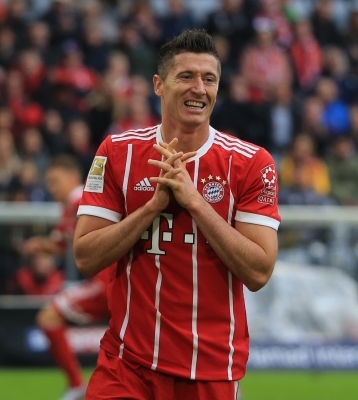 According to reports, the 2013 treble winner is targeting a back-up for Polish international Robert Lewandowski but faces several problems as the new striker must address high-quality standards and must be available as soon as in the next winter break, reports Xinhua news agency. After Lewandowski was substituted in the latest Bundesliga game against RB Leipzig seconds before halftime to avoid a muscle injury, the team’s difficulties came to light when they had to play without a traditional spearhead up front. Now the club has announced that Lewandowski will miss the game in Glasgow. Bayern’s club leaders such as President Uli Hoeness and CEO Karl-Heinz Rummenigge admitted to having misjudged the situation last summer as they decided to only count on the 29-year-old. Bayern’s fatal dependency on Lewandowski was revealed when Bayern’s game lacked efficiency when Thiago, James Rodriguez and Sebastian Rudy unsuccessfully tried to close the gap acting as a false nine in the opponents’ box. In the past two years, Lewandowski was in action in 95 percent of the clubs games. In 2017 the Pole scored 28 goals in 27 Bundesliga games. In the 2017-18 season, he scored two goals in the German Cup, one in the Champions League and 10 in 10 Bundesliga games. According to media reports, Bayern is thinking about German international Timo Werner but the striker of RB Leipzig won’t be available soon as his contract with the club is running until 2020. Leipzig CEO Oliver Mintzlaff told German media the club does not intend to sell the 22-year-old. Bayern’s trouble increased after strikers such as Franck Ribery and Tomas Mueller were sidelined due to injury.